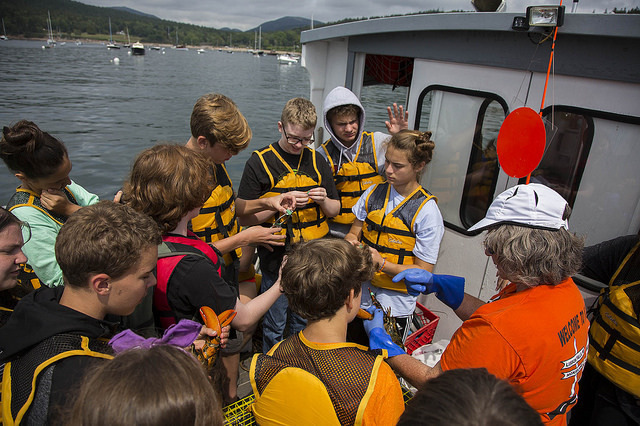 Tell us a bit about your path to a career in Ocean Education? And what drew you to Maine? I graduated from Kalamazoo College in Michigan with a BA in Theatre and Psychology and my teaching certification. 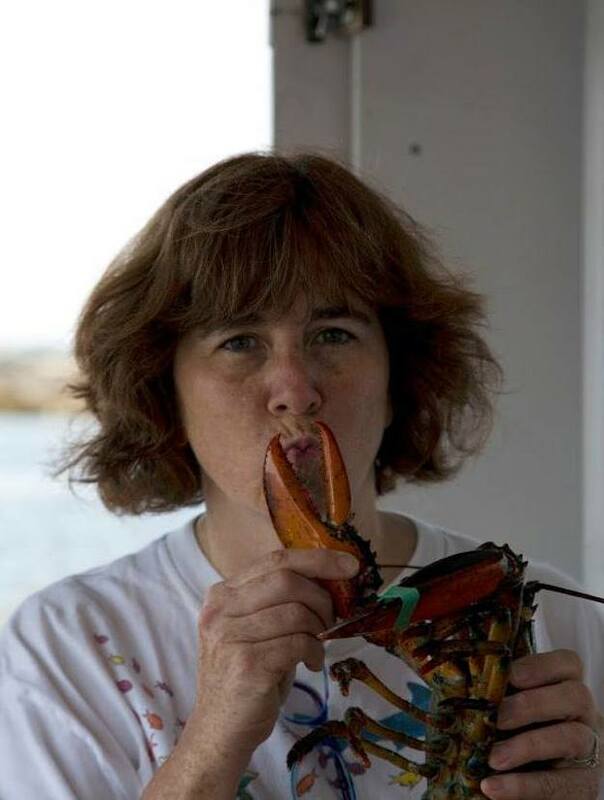 During college I was hired to teach environmental education at the Stone Environmental Schools in Ocean Park, Maine – It was my first trip to Maine and my first teaching job… I loved them both! I went back to Michigan but kept returning to Maine every chance I got until I graduated and moved to Maine permanently. The Acadia Institute of Oceanography (AIO) was founded in 1975 by a chemistry teacher from Newton, Massachusetts named George Hahn. I learned about AIO from a friend and co-worker who already spent summers in Seal Harbor working there. I went from a recreation staff member to a program director over the next 8 years, until George Hahn asked me to purchase the program. I felt privileged that he trusted me with his “baby” and I think he would be pleased with how it has grown. Our students have traveled to Jamaica, Bermuda, Belize and Florida and we continue to offer these programs each winter. We also now offer 4 college credits for our Advanced sessions through the University of Maine Machias. In addition, the College of the Atlantic offers $10,000 annual scholarships to accepted students who have participated in our program. My goal for the near future is to continue teaching future generations to be good stewards of the ocean. What do you find is the key to inspiring students today? Make it relevant and show them how they are connected to the ocean whether they live near the shore or in the middle of the country. They also need to see that they can make a positive impact so I encourage them to not let the large number issues overwhelm, but rather choose one topic in which to focus. If everyone does one thing to make a difference, change will come. Through your experiences, what’s the biggest threat that our world’s oceans face? This is a tough one since so many issues are intertwined. Increased population leads to overfishing, pollution, ocean acidification and overfishing. Even when we do our best to lessen our footprint on the earth, we effect it negatively just by living our lives. Our goal is to have as small an impact as possible. One of my biggest concerns today is the politicizing of environmental issues so that they are looked at as opinions rather than scientific facts. Education at a young age is key which is why I do the work I do. When kids grow up not using single-use plastics, recycling, using fewer fossil fuels and more renewable resources and appreciating the ecological importance and general beauty of the ocean, they become habits that should follow them into adulthood. I have a lot of hope for our future when I work with my students and often tell them that they are the next generation decision makers. They need to stay educated and make informed decisions for the earth and it’s entire population (not just humans). How do you maintain a positive narrative for your students when so much of the news surrounding our oceans is negative? I agree that it can get overwhelming and it seems like a lot of gloom and doom. We try to take the blame and politics out of it all and talk about the science. I also believe it’s very important to discuss the issues, our part in creating those issues and how we can change it. Nothing is more depressing than listening to a talk on a problem only to walk away without any ammunition to make a difference. What’s the most important skill for students to develop who wish to pursue a career in Marine Science and Conservation? Avoid snap judgements and try to find ways to work together. I’ve never met anyone who wants to see all of the fish disappear from the ocean but I have met people in Caribbean countries who are desperate to feed their families and so don’t worry about how they are fishing. I’ve been to countries where a family doesn’t know where their next meal is coming from so they aren’t worried about how they dispose of their garbage, dumping it right outside their door where the rain washes it into the ocean. We are lucky in the US to have the options that aren’t available to many others around the world and it’s always educational when I take students to these places that struggle with these issues. What’s one thing anybody reading at home can do to help the oceans? Choose to wake up every day and make one conscious decision to be less wasteful. One step everyday will lead to miles in the end. This post originally appeared on The TerraMar Project's website. The original post can be viewed here. How I Sea is a new effort by The TerraMar Project to dive into the minds of our global ocean community. We highlight opinions on conservation issues such as: marine pollution, overfishing, drilling, climate change, marine protected areas, scientific discoveries, and much more. Stay tuned for more.